Irrashaimase (welcome) greets us from every side as we walk in the door. The waitress, smiling widely, greets us with a bow and I can't help bowing back. I can't help smiling either. We get a table by the window. All the others are full. This is a good sign. I have never been to Japan, but my partner lived there for over a year and assures me that Ajisen is as an authentic experience as you are going to get in Brisbane. 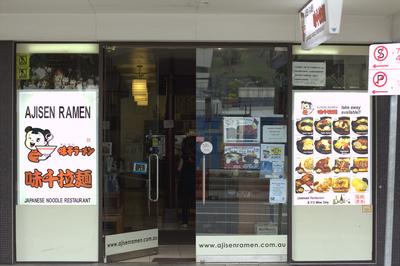 Ajisen Ramen was founded in Kumamoto in 1968 and the name literally means world ramen. Ramen is a Japanese noodle soup and the variety is limitless. Each region of Japan has it's own specialty. Ajisen uses the creamy pork bone (tonkotsu) soup as the base for their dishes, but leaves a huge variety of toppings to choose from. According to the website, their tonkotsu helps to prevent aging. I'm not sure about that, but you definitely walk away feeling better. Especially if you brave the Volcano Ramen. Japanese cuisine has always recognized the existence of a fifth taste, umami (savoury), along with the traditional sweet, sour, salt and bitter. Dashi, or stock, is the main source of umami in Japanese cooking and Ajisen Ramen's authentic dashi is full of umami. Gochisosama deshita! (Thanks for the meal).